I was not raised as a woods-traipsing boy. Central Florida, where I spent much of my childhood, can give you a great deal on theme park tickets or a killer ocean view, but you’ve got quite a drive ahead of you if you want to find a forest to get lost in. It wasn’t until my college years when I first discovered the “pleasure in the pathless woods” and the wonder of camping, hiking, canoeing, and other outdoor pastimes. I had some catching up to do, but in the two decades that my wife and I have been together, we’ve managed quite a few camping adventures, and since our boys came along a decade ago, there have been a lot more. What if this trip is a failure? Well, I had to shrug those anxieties aside, and I did, and we went. And the trip was an absolute blast. We climbed rocks and beheld waterfalls. We survived a torrential rainstorm and stayed bone-dry for the entire night. We played Pooh sticks on an old wooden bridge. We crammed down obscene amounts of s’mores. We ate at a Chinese buffet on the way home. At trip’s end, we returned home muddy, smelling of campfire smoke, and, most importantly, with a shared bonding experience that was all our own, a pocketful of memory-souvenirs. Of course, in the days that followed, I found myself wondering, “Why was I feeling so inadequate before I left?” Which brings me to the title of this piece, something I wish I’d considered more prior to leaving. Now, I’m a writer, and this is a great piece of storytelling advice. What creates a lasting reader-character bond is the attempt at something, not necessarily the success. When Charlotte hatches her save-Wilbur plan, or when Frodo exclaims (quite unexpectedly), “I will take the ring to Mordor, though I do not know the way,” we love them for it, regardless of how it all turns out. I’m convinced that applying this storytelling principle to parenting is refreshingly reassuring. Call it “Pixar Parenting Rule #1.” My children appreciate the effort I make to get involved in their lives, no matter the outcome. By objective standards, this involvement may not always turn out to be a rousing success, but if I try, I win. As when, this summer, my boys invited me onto the trampoline to play a silly ball game they’d invented. I felt a bit goofy up there bouncing around trying (and often failing) to avoid getting pelted by our black rubber Batman ball. I lost and fell a lot. But the laughter – I believe – means the attempt was appreciated. And, over the summer, there were plenty of games of Gaga Ball played. The heroism is in the risk, the attempt, because it springs from a place of caring and a desire to join their lives and be together. That’s where the victory comes from. That’s what defines success. Whether it’s joining in on a game, coming alongside to help with an unfamiliar school assignment, or stepping out of my comfortable place in any one of a dozen circumstances throughout my day, just being there, attempting to help and participate, can go a long way toward demonstrating love and incarnating goodness and truth in their lives. 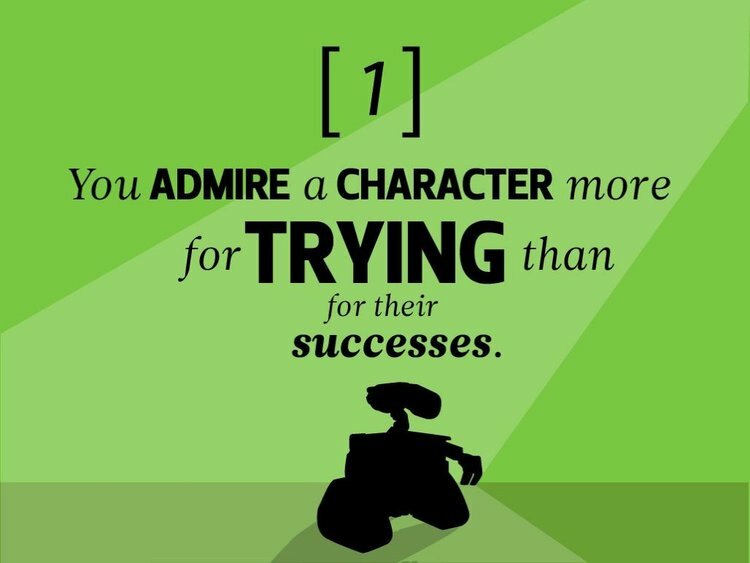 So I’m going with it, thanking Pixar for helping me to see that in parenting – thank goodness – success or failure isn’t as much dependent on the outcome as the attempt. Very true. this was a good reminder for me as I worry about screwing up my kids now that I am homeschooling this year.